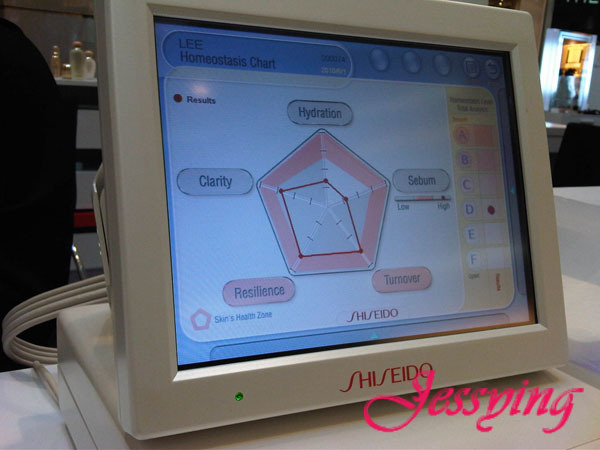 Thanks to Susan's our beauty spy to let us know that Shiseido is having roadshow in KLCC, Concourse level Centre court! The Roadshow is starting from today 1st June to 7th June 2010. So I went to check out ! The promoter asked me to have skin test first and I am so glad the skin condition has improved so well!!! I am going to post the previous and current skin test result later !!! Because its so good it deserve a separate post! The Gift with purchases !!!!! Additional bonus and gift !!! I was given 3 pcs skincare after the skin test! White Lucent Brigtening Cleansing Foam w, Brigtening Balancing Softener Enriched w and Brightening Protective Emulsion w Sph15. Note : I must share with my dear readers that currently I am using their White Lucent Brightening Cleansing Foam w and have tried their White Lucent Spot Targeting Serum, its so darn good but its RM410 !!!! And after using it my skin become brighter, smoother and more moisture! I need more money ! Apart from that, I was reading The Star over my lunch and found out that Shiseido also advertised in The Star Paper under Metro Central section, page M9, a list of starter kits with price are shown. 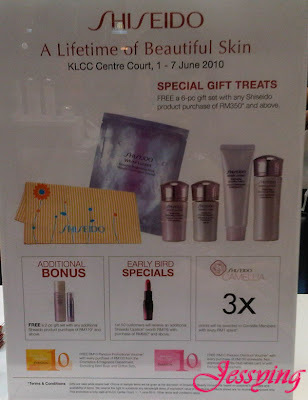 Also there is cut out voucher for you to present it at Shiseido KLCC Roadshow to enjoy Free Skin Analysis and 3 pcs skincare for free. And for those who wants to stock up their skincare from Shiseido or try their products, this is the best time to go ! suncare starter kit got wat ah? tangzi : Got Shiseido ANESSA Perfect UV Sunscreen, White Lucent Brigtening Cleansing Foam and Softener ! juli : worth trying, its quite good, work well for me :) if you are still not sure, you should get samples from the roadshow to try, 3 pcs sample. ya..my sis just pass me the newspaper..i will get in done by this friday..friday is my offday..